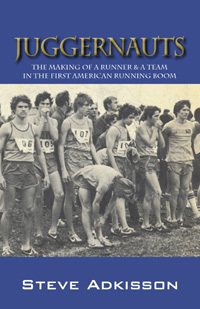 As the first running boom was sprouting in the early 1970’s, a group of Kentucky teenagers found themselves under the guidance of a young coach who was ahead of his time. Cross country was regarded as a sport for the slightly odd and unathletic, a means of “getting an easy varsity letter”. Among this group of runners was a particularly odd (though strangely athletic) teenager who was taken in by the joy of running over the grass, hills, and mud of cross country courses. The coach and seasonally growing team rose to dominance of Kentucky cross country in the span of four short years. Along the way, they “learned the lessons every runner has to learn, mostly the hard way, many of them twice.” From humble backgrounds, the Lloyd Memorial High School Juggernauts led the way for high schools in Northern Kentucky to win State Championships for over thirty consecutive years. This is that story. Finally, the completely revised Second Edition is now available. Demand for the first self-published edition took me by complete surprise. I had no idea people other than my friends would want to read this book, so I had not edited it to the standard of a marketable book. Enjoy! A review of Steve Adkisson's book "Juggernauts" critque by Dr.Stacy Osborne author of the Rock Novel "Life 101 Trilogy"
-Billy Anderson, 7 time qualifier for the Xterra National Triathlon Championships. Steve Adkisson graduated with a degree in Creative Writing from Murray State University. He has written for a wide range of magazines including: Runner’s World, Carrozzeria, Banjo Newsletter, and National Review (Australia). He has been a runner since shortly after he could walk.